Diana and I visited the ROM on Wednesday, July 1, 2009 in the afternoon. Having read on the internet that hours had been expanded for the summer specifically because of the Dead Sea Scrolls (DSS) exhibit, we expected it to be busy. Still, we were a little surprised by the queue outside the ROM, from the front door right to the Bloor Street sidewalk! However, since we went all that way, we determined we would get into the line, and we were relieved that it moved quite quickly. From the time we first queued up, we were inside the door in about 10 minutes. Moving inside the building, however, there was another 10 minute queue to purchase tickets. The ROM knows many people will come just for the DSS exhibit, and are taking full advantage of that; adult admission to the ROM is $22, and to see the DSS as well the admission is $28. But, curiously, one cannot pay a lesser amount just to see the scrolls! Our tickets were purchased for admission to the DSS at 2:30 (it was about 2:00 when the tickets were boug ht). We took our time, poked around a little, and then moved downstairs to queue up for the exhibit. That line took about 15 minutes to get through. Once we were beyond the entrance, one could wander wherever one wished, and we did. There is a great deal of historical context given to the DSS before one ever sees a scroll in this exhibit, and that’s good, given the dearth of biblical and historical knowledge of today’s average museum-goer. Everything is, of course, under glass – a good thing considering the age of these artefacts. The first item one sees on exiting the queue is an earthenware jar, a replica of one of the pots in which the DSS were found in the caves over the Dead Sea at Qumran (pictured at right). Next, one sees several ossuaries (containers that hold human skeletal remains). These ossuaries are small, only a little bigger than the average laser printer. The exhibit contains several of these, perhaps just to give some anthropological context to the era of the scrolls. 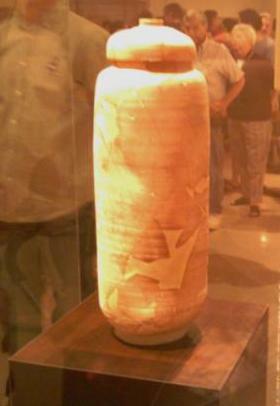 Other jars and artefacts, as well as c oin replicas, are on display. One example that surprised me by their size was a series of phylacteries. Phylacteries were little boxes in which some portion of the Law was written, and these were tied onto the arms or foreheads of faithful Jewish people (pictured at left); they were created as a response to Deuteronomy 6.8-9. Their uses and abuses are noted by Jesus in Matthew 23.1-6. Coin replicas can be found from the time the DSS were first written. It’s worth noting that not all of the DSS contained what we know as Holy Scripture; there were several ‘extrabiblical’ documents found, including some texts that just added more laws to the community regulations. Others were non-canonical Psalms (that is, Psalm texts that were not chosen for inclusion in the Bible). The history is worth stopping to read. There, one learns about the different sects (Pharisees, Sadducees, Essenes) and the history of the various Jewish revolts, some of which took place during the writing of the DSS. Several videos are available to watch, which show archaeological sites, stories of the commercialization of the DSS after they were discovered, and how they have been preserved. Beyond this, one gets to view some of the scrolls. As the ROM says on its website, there will be a second ‘round’ of scrolls that will be shown later in the year; some may want to visit twice to see them all. The labels put on the scrolls can be a bit daunting to understand. For example, one of the first scrolls one sees on display is called “4Q112”. It contains parts of the book of Daniel in Hebrew and Aramaic, and is dated to approximately 50 BC. The “4Q112” means that this scroll was found in the 4th cave, at Qumran, and it was the 112th scroll catalogued. If you’re used to telling time with “BC” and “AD” as I am, you’ll want to know that because of the pluralistic context, scholars use “BCE” and “CE” to be politically correct. This is explained at one point during the exhibit. What we know as “BC” is “Before Christ” and “AD” is Anno Domini, “In the year of our Lord”; those who aren’t so crazy about Jesus (and others who are being sensitive to same) use the rather more mundane terms “Before the Common Era” and “Common Era”. Among the scrolls that are currently on display are the one from Daniel; an apocryphal (‘hidden writing’) Psalm; a Messianic Apocalypse (a document that purported to show the coming of the Messiah in an end-times context); a fragment containing Psalm 102.26-29 and 103.1-3; a section from the Book of War (dated to around the time of Jesus, or a little after); and even an old agreement (Bar Kokhba)! Near the end of the exhibit – before entering the inevitable gift shop – there are some very old samples of Jewish, Christian and Muslim Scriptures. (The New Testament that is on display is a Mohawk translation, which was the first translation work done by a Bible Society anywhere in the world; it was done in the very early 1800s for the Mohawks at the Six Nations Reserve at Brantford, Ontario.) The writing on the wall of this section claims that all three major western faiths worship the same God as Abraham did; while it is indisputable that all three trace their roots back to Abraham, I think it is entirely debatable as to whether or not Muslims can still claim to worship the same God as Christians or Jews. Diana and I have two prints framed in our living room that are pieces of art based on fragments of the DSS, by Mrs. Lika Tov; her husband, Dr. Emmanuel Tov, is one of the leading scholars on the DSS in the world. We purchased ours directly from the artist at a DSS symposium sponsored by the Canadian Bible Society a couple of years ago. Several of Mrs. Tov’s prints are available for sale in the gift shop at the end of the exhibit (though for a much higher price than we paid for ours). Also in the gift shop are, among the dust collectors, some books that would be worth reading if you want to learn more about the scrolls. I also have a couple of volumes in my library if you would rather borrow than purchase. We completed our tour of the exhibit in approximately 30 minutes, but we are not lingerers at such things. If you stop to read everything, you will take quite a lot longer, and there is certainly the freedom to do so. If you go on a day when the line-ups are not as long, a more leisurely tour may be in order. Second, we should be encouraged by the great interest in this exhibit. The cashier who sold us our tickets told us that 20,000 tickets were pre-sold for this exhibit. To be sure, many of those interested in this exhibit will be of Jewish origin because, after all, the scrolls are ancient Jewish writings. But there is a great possibility for witness to God’s faithfulness in preserving his Word as he has. (Remember, the Dead Sea Scrolls are about 1000 years older than the oldest Old Testament manuscripts previously used in Hebrew Scripture scholarship and translation.) People who think that the Bible is some sort of useless fabrication can do some reading, and see these scrolls, to understand that God’s hand has been mighty in the purpose of preserving the Scriptures for his people. Folks are open to “spiritual things” even if they are not necessarily open to “church”; their openness to “spiritual things” can, however, lead to a deeper interest that may ultimately prompt them to at least visit a church on a Sunday morning. Perhaps one of them will be a friend whom you can bring with you! This exhibit has potential to draw many questions out of its visitors. I’m confident that God is using it to open a door for many to receive Jesus. May the church – you and I – be ready for what God is doing!